The LED version of our most popular RCL-100D searchlight provides high intensity LED performance that pierces through night and low lighting conditions with a blazing 220,000 candela. The RCL-100 LED’s traditionally sleek design makes it an attractive and cost effective choice for sport yachts, mega-yachts, sport fishers as well as light commercial vessels. With more efficient LEDs, the RCL-100 LED now has reduced power consumption demand by up to 50% on 12V vessels. The RCL-100 LED continues to utilize the same rugged design as the original RCL-100, but incorporates a new efficient 9 LED array that produces over 220,000 candela of light. The die cast aluminum housing and glass lens are sealed against the elements for years of trouble-free operation. Other features include a wired remote control operation that allows users to rotate the light 360 degrees continuously at either a fast or slow speed without the hassle of a hard stop. With a 7 degree beam angle, the light also provides elevation angles at 9 degrees up and 17 degrees down to make lighting draw bridges, buoys and docks a breeze. Not all searchlights are created equal. The die cast aluminum case is triple-primed and painted with UV stabilizer to withstand years of exposure in the harsh marine environment. The light’s internal elevation mechanisms are fully enclosed and provide precise pitch control of the beam while staying protected. The LED bulbs are efficiently designed to provide over 40,000 operating hours. The light also includes our Exclusive XRCiZ™ feature that is pre-programmed and allows for the light to independently rotate every 30 days from activation to ensure all bearing surfaces are free of corrosion and all electrical contacts functional. 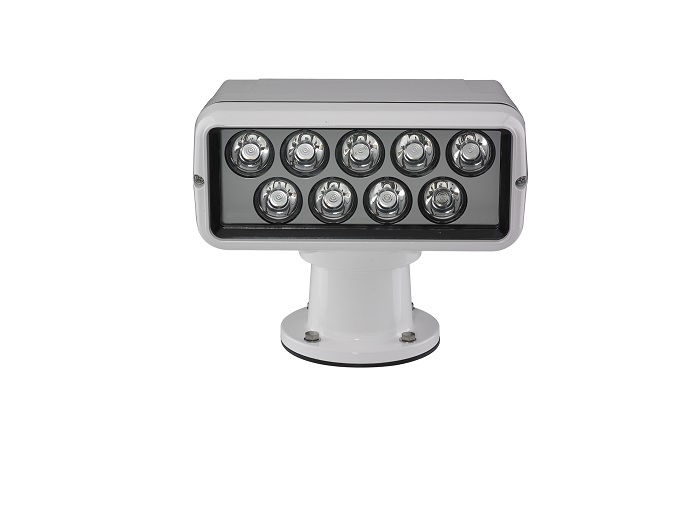 The RCL-100 LED is weather resistant and operates with 12 or 24 DC power.